Building a better Wrangler means more comfort, tech, and capability than ever before. TUCSON, Ariz. — We crawled, with the lightest possible touch of the accelerator pedal, over a boulder-strewn mountain peak just outside of Tucson. We'd been driving for a few hours already, through city streets, along the highway, through twisty stretches just outside of Saguaro National Park. 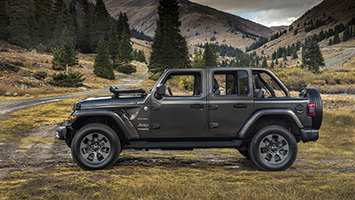 But it wasn't until we were pointed skyward, at such a severe vertical incline that we could only barely make out the hands of the trail guide ahead, that we knew Jeep had nailed the 2018 Wrangler redesign. That light-bulb moment was punctuated by the screeching steel impact of a skid plate along the jagged edge of a boulder. There's just something that feels right about a vehicle designed with purity of purpose. Leave the one-size-fits-all approach to the midsize crossover; stop attempting to be all things to all people like the midsize sedan. The problem with narrow-minded vehicles, though, is that they all require some sort of significant compromise to live with on a daily basis. With the latest version of the iconic Wrangler, Jeep set out to banish as much compromise as possible. 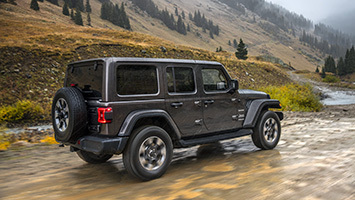 Smoothed-out corners and lightweight materials improve efficiency, a range of engine choices opens the envelope to a larger swath of buyers, and big infotainment screens and backup cameras make the 2018 Wrangler easier to live with than ever before. But that essential purity of purpose remains intact. 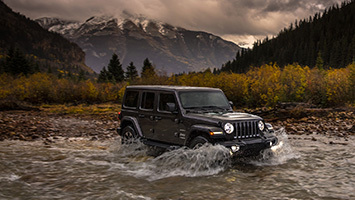 The latest Wrangler is better in every way than its predecessor, a fact that rings true no matter what type of terrain you're driving on. A casual observer may not notice the subtle exterior tweaks made to the 2018 Wrangler, codenamed JL, over the JK model it replaces. The round headlights, LED units on higher-end models, now cut into the outer two vertical grille slats, which are canted back just enough to make a difference in the wind tunnel. The windshield, too, is swept back further than ever before, but not so much that it messes up the Wrangler's timeless design. Hood and door latches are still externally bolted to the body — crucially allowing the doors and windshield to be removed or folded down for the pinnacle of open-air motoring — like little lumps of clay the designer forgot to smooth out. 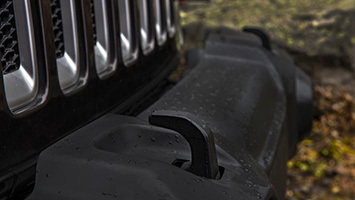 Vents in the front fenders reduce underhood pressure and keep the hood from writhing about at speed as it did on Wrangler models in the past. 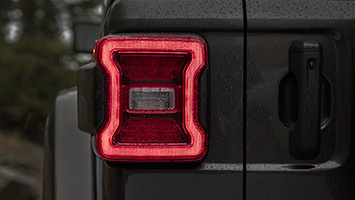 So picky are Wrangler customers that Jeep's decision to move the turn signals ignited a thousand threads on internet forums worldwide. What happens when you swap the fenders for greater tire clearance? The aftermarket and Mopar's own parts catalog have that covered. Additional lights, bigger wheels, winches, lift kits — all will be available by the time the first 2018 Wrangler JL rolls off the showroom floor. Jeep knows the Wrangler is a kind of blank slate to its owners, so a bank of auxiliary switches come straight from the factory to make it easier to install accessories. The interior of the 2018 edition is nicer than any Wrangler that has come before. 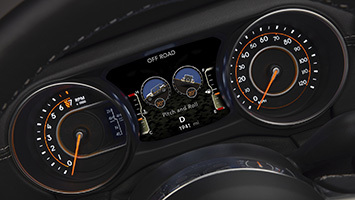 The automotive world has gone digital, and the Wrangler has changed with the times. The gauge cluster has either a small 3.5-inch LCD unit or an optional 7-inch full color display that can show the current angle at which the vehicle sits — handy when pointed up or down a mountain. An infotainment screen as large as 8.4 inches dominates the center stack (smaller 5- and 7-inch screens come standard). 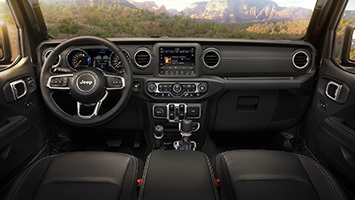 Chrysler's Uconnect system is easy to use, with quick touchscreen interface and duplicate buttons and switches for climate and audio systems. Android Auto and Apple Carplay are available, as is 4G LTE Wi-Fi Hotspot connectivity. And don't worry, grab handles galore have been integrated inside so that there's something solid to hold on to, even when the doors have been removed. Those doors are now made from aluminum, making them lighter than before — 47 pounds for the front doors and 34 for the rear — and a molded-in grab handle means they can be handled without fear of dropping them. Jeep actually considered whether it was time to jettison the folding windshield, but ultimately decided if they made it easier to accomplish, more people would do it. And so it takes only four bolts, using a tool provided with every Wrangler, and about five minutes to completely lay the front glass flat, providing a commanding view of the elements. 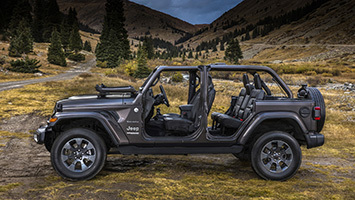 Wrangler buyers will have several tops to choose from, starting with a standard soft convertible option that eschews old-fashioned zippers for a much simpler tongue-and-groove setup. We can confirm (having owned a 1990 Wrangler with its standard soft top) this standard soft top is much, much easier to remove and reattach than previous designs. 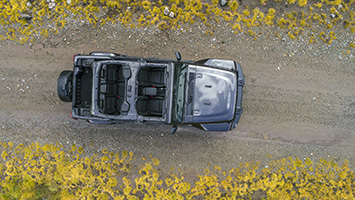 A hard top remains available that can be removed in multiple pieces to open the Wrangler up over the driver, front passenger, rear seat passengers, or in its entirety. New for 2018 is an all-new Sky One-Touch top that is meant to stay firmly attached to the Wrangler at all times. A full-length sliding canvas opening uncovers the entire interior, and the two rear-window sections can be removed separately. 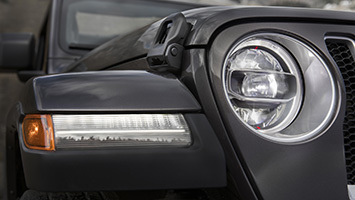 We have a feeling this is going to be a popular option on the new Wrangler. All of that is well and good, but none of it matters a heap if the new Wrangler is a slouch off-road. Fortunately, a fully boxed ladder frame, a five-link coil suspension setup with Dana solid axles front and rear, standard skid plates, and, on Rubicon models, steel rock rails are all in place from the factory. 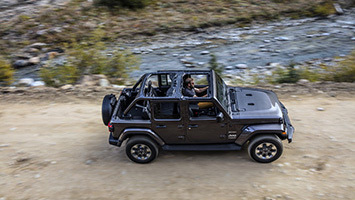 An approach angle of 44 degrees, breakover angle of 27.8 degrees, departure angle of 37 degrees, and ground clearance of 10.9 inches mean this generation of the Wrangler is a veritable mountain goat. Variable assistance electro-hydraulic steering is new for 2018, and it works fine. We often opine about the loss of steering feel on sports cars, but that's less important than the right ratio and adequate boost for a Wrangler. Bump steer has been reduced with outward-facing steering knuckles. The turning radius is 34.5 feet on two-door and 40.8 feet on Wrangler four-door models, both tighter than the previous generation. When the 2018 Wrangler goes on sale early next year, the standard engine will be a 3.6-liter V6 producing 285 horsepower and 260 pound-feet of torque. 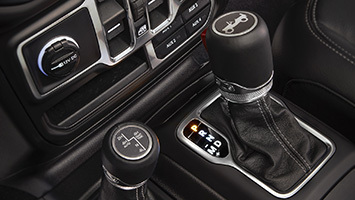 A six-speed manual transmission comes standard, and an eight-speed automatic will be optional. 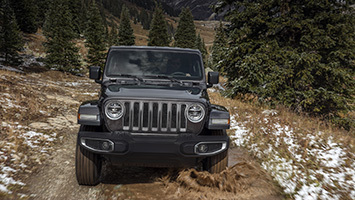 Stop/start technology helps the 2018 Wrangler Unlimited V6 achieve 18 miles per gallon in the city, 23 on the highway, and 20 combined (manual transmission models drop 1 mpg city and combined). This 3.6-liter V6 engine and eight-speed auto are the same ones used in the Jeep Grand Cherokee and Ram 1500. As in those applications, acceleration is perfectly adequate, and there's very little hunting and pecking as the gearbox picks the proper ratio. There's just enough power to spin the rear tires from a standing start, but the Wrangler is certainly no hot rod. The six-speed manual is fine, with a reasonable clutch pedal that's not too hard or long to make using it a pain. A few months into 2018, a new 2.0-liter turbocharged four-cylinder will start hitting dealerships across the country. With 270 hp and 295 lb-ft, the direct-injected turbo mill will be an extra-cost option across the entire Wrangler lineup. An eight-speed auto is the sold transmission with the small-bore mill, and EPA estimates are not yet available. It'll run on 87 octane just fine, but premium is recommended for maximum power and efficiency. A mild-hybrid setup helps save some gas and allows for some regenerative braking energy to be used to power the Wrangler's accessories. We found the 2.0 to feel slightly quicker in full-throttle acceleration than the V6, particularly once the engine nears its 3,000-rpm torque peak. Power just off idle isn't great, but the low overall gearing of the transmission and axles put the little motor into its somewhat high powerband pretty quickly. If we were spending our own money, we'd probably stick with the standard V6 unless the fuel mileage benefit is substantial. Even if the four-cylinder is torquier (at least with 91-octane fuel), the real-world difference is negligible, and neither engine is going to blow your socks off at the drag strip. Plus, we'd want that manual gearbox. A 3.0-liter diesel V6 will arrive for the 2019 model year, producing 260 hp and 442 lb-ft. We'd love to tell you more about it, but we'll have to wait for Jeep to finish development and let us slide behind the wheel. Given how much we like the oil-burner in the Grand Cherokee and Ram EcoDiesel, we expect good things to go along with a several-thousand-dollar upcharge. The 2018 Jeep Wrangler Sport starts at $28,190 including destination in basic two-door trim, or $31,690 with four doors. 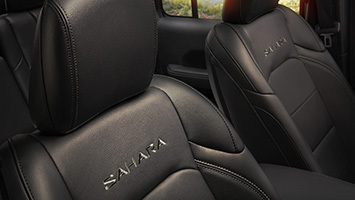 Sahara models only come with four doors and start at $38,540. A two-door Rubicon, the most expensive trim, runs $38,190 and the four-door is $41,690. That's a couple thousand dollars more than the previous Wrangler when compared trim-by-trim. 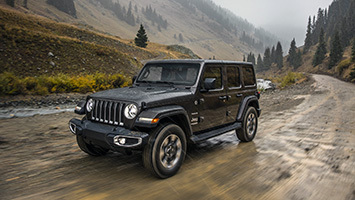 Three transfer case options are available on the new Wrangler, starting with the tried-and-true Command-Trac part-time four-wheel-drive system. A 2.72:1 low range allows for a rock-crawling low gear of 48.18:1 with the manual transmission, or 44.20:1 with the automatic. This system is standard on Sport and Sahara models. Wrangler Rubicon models get a beefier Rock-Trac system. A 4:1 low gear ratio allows for a 84.2:1 crawl ratio with the manual, or a 77.2:1 with the automatic. Rubicons also get heavy-duty Dana 44 axles front and rear, Tru-Lok electric front- and rear-axle lockers, and an electronic sway bar disconnect for greater suspension articulation. 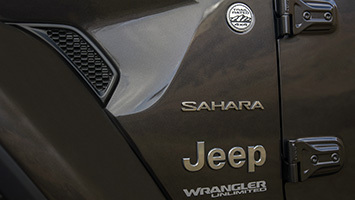 For the first time ever in a Wrangler, a full-time four-wheel-drive system will be offered on Sahara models. There's still a 4.0:1 low gear for rock crawling, and the ability to lock in four-wheel drive ought to make the Sahara an attractive option for owners in the Snow Belt. Four-wheel disc brakes are standard across the board, as are Electronic Stability Control, electronic roll mitigation, and trailer-sway control. The ESC system has three different modes: full on, full off, and partial on. Though there are no specific snow, sand, or mud settings in the Wrangler, the multi-mode ESC helps dial in the right amount of electronic assistance to maintain traction. The funny thing about all of these specifications is that they simply don't matter when you're out in the world, experiencing nature, and having fun in a Wrangler. The last things we were thinking about while piloting a Wrangler Rubicon over the rocks were angles, ratios, clearances, and turbochargers. And that's because everything just works. We pulled back into the off-road staging area after a second run up and over the mountain on an unseasonably cold day in Arizona, heat on full blast and heated seats on high. We admitted to bashing a skid plate on one particular hairy stretch of boulders. "No problem. That's what they're there for," responded an unknown engineer. And that sums up the 2018 Jeep Wrangler. Sometimes, you just want to go bashing through the rocks, the mud, the snow, or the sand. And that is exactly what the Wrangler is there for. The fact that it's so much easier to live with the rest of the time proves that this is the best Wrangler that Jeep has ever built.